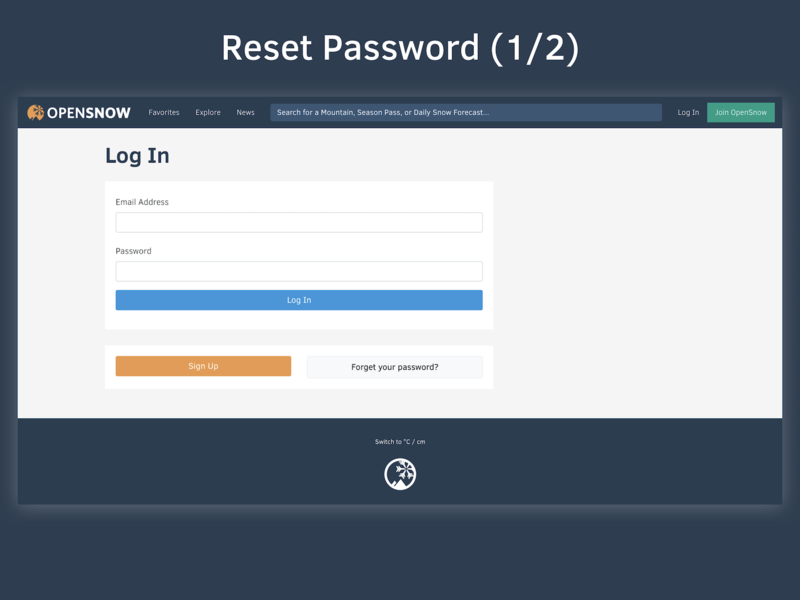 Over the past 12 months, our product team of Andrew Murray, Erik Smith, Joel Gratz, and I have been working behind-the-scenes to bring you the next generation of OpenSnow. We took years of user feedback, brought together our wish list of ideas, and worked through hundreds of hours of discussion to bring you our first release of the redesigned iOS App and now, the OpenSnow website. Why did we redesign the site? The majority of our website visitors are on mobile devices, and the old website did not work as well on mobile as we would have liked. Plus the code for the old website was over 5 years old and needed to be brought up to modern standards. Thus, we needed to make an update, and along the way, wanted to add new features. Also, we wanted the new website and our new mobile app to have similar features and a similar layout so users only had to learn how to use our product once. The Favorites page (previously called the "Dashboard") is the first major change that you'll encounter when you log into your Free or All-Access account. 'Your Daily Snow Forecasts' is still the top item on the left sidebar. Simply click and you'll be reading the latest update. 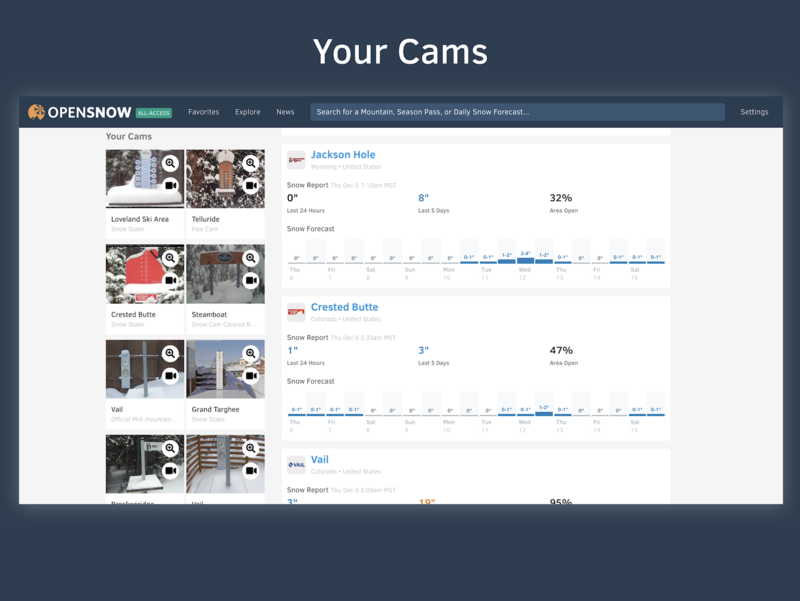 The next section on the left sidebar is 'Your Cams'. 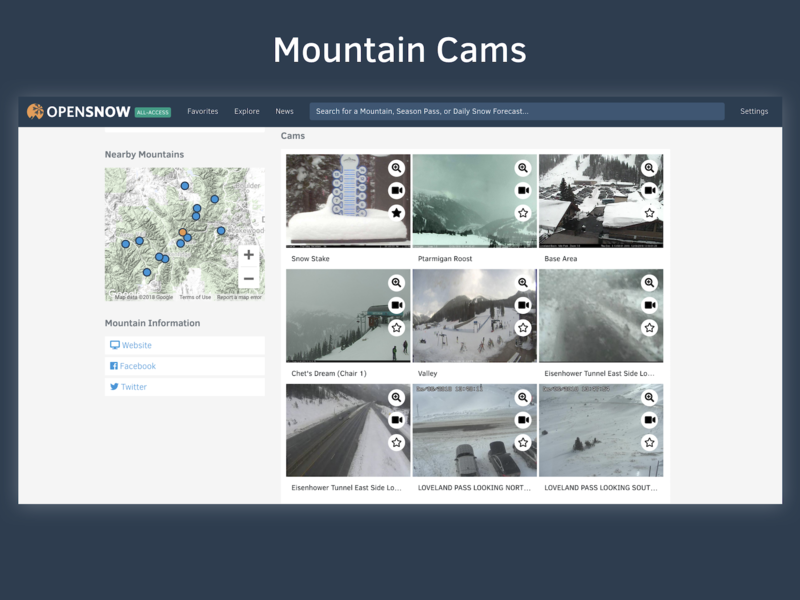 If you want the convenience of seeing your favorite snow stake and other mountain cams on your Favorites, upgrade to OpenSnow All-Access for $19/year. 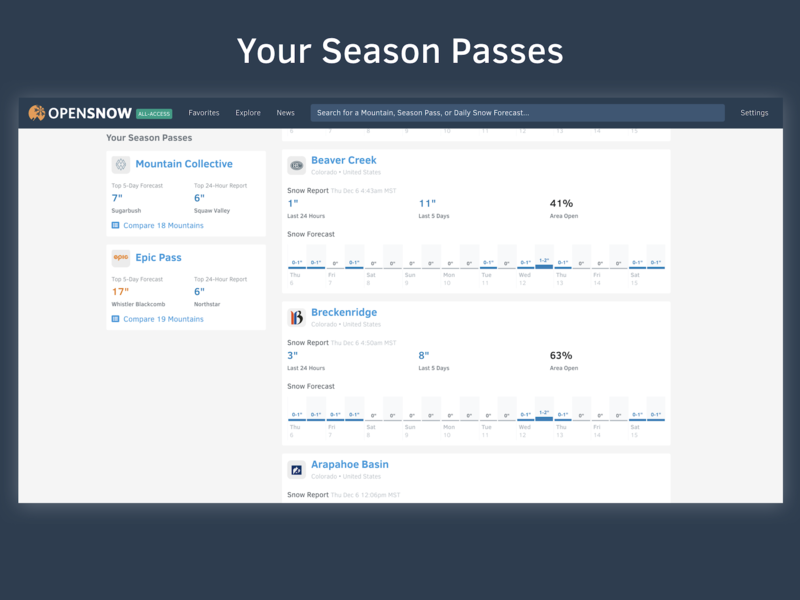 The final feature that we love on the left sidebar is the ability to save and follow 'Your Season Passes'. 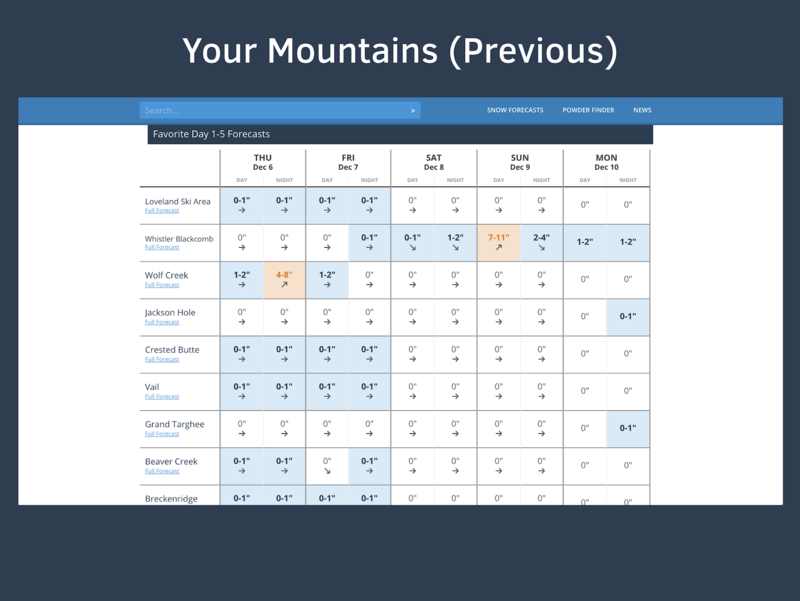 Now for the main feature of the new Favorites page, the redesigned 'Your Mountains' section. Right off the bat, you will notice that the old table-view dashboard is no longer available in the redesign. The old table-view was very granular (good at times) but we have found that we often miss the bigger picture (eg. 10" in 5 days). It also did not provide the opportunity for All-Access subscribers to see the 10-day forecast in one view. 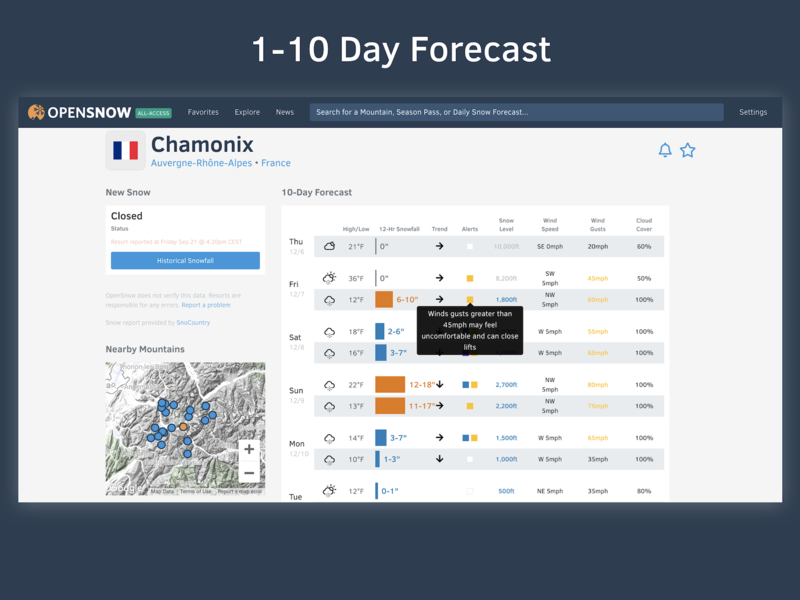 The new forecast graph solves the issue of not getting lost with multiple 1-2" day/night forecasts and provides an improved visual representation of the changing forecast when comparing mountains. 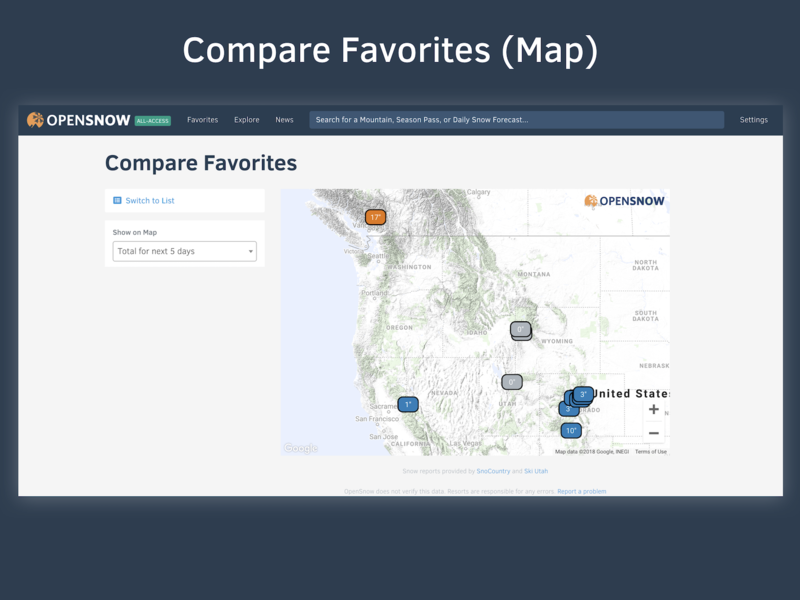 Another new feature is the ability to compare your Favorites in a list or map view. 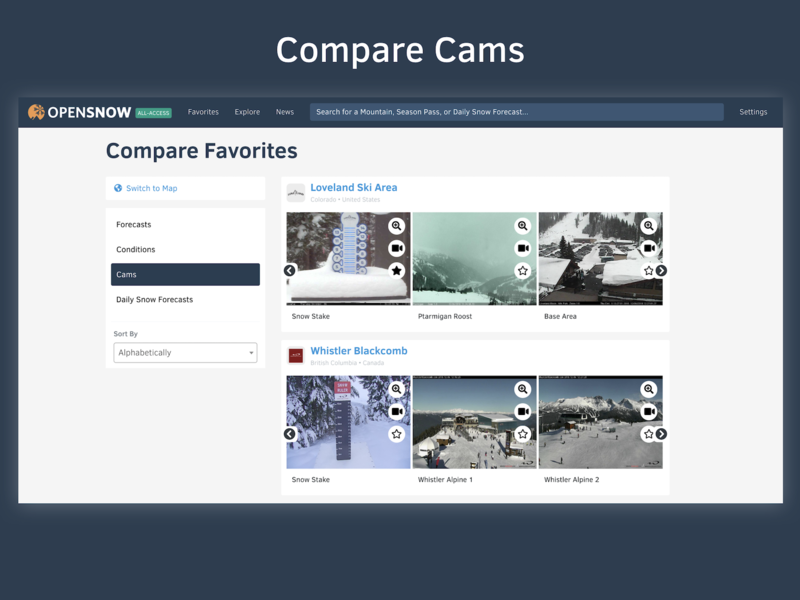 Simply click the 'Compare Your Mountains' button at the top of your list and compare the latest Forecast (next 1, 5, and 10 days) and Conditions (last 24 hours, 5 days, % ski area open), along with a breakout of the Cams for each mountain. 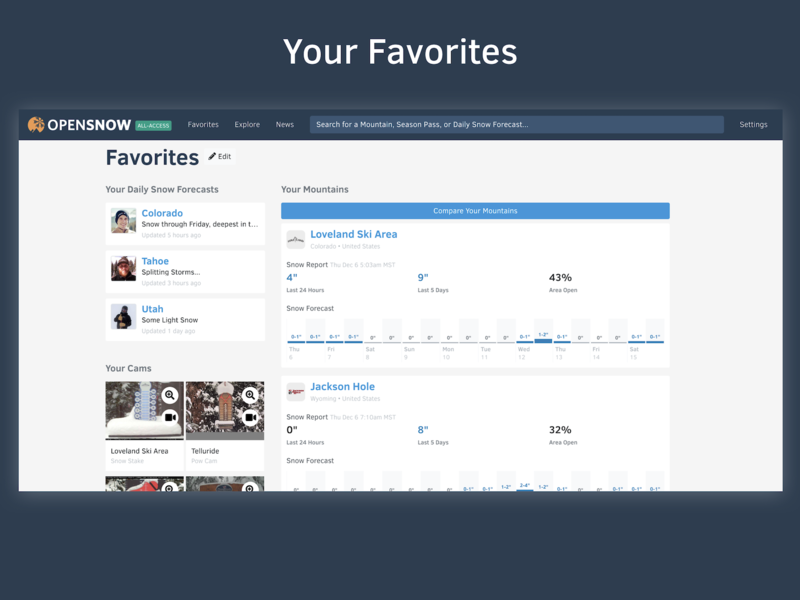 'Your Favorites' is still a work-in-progress but we are very excited with the transformation. Stay tuned for further updates! 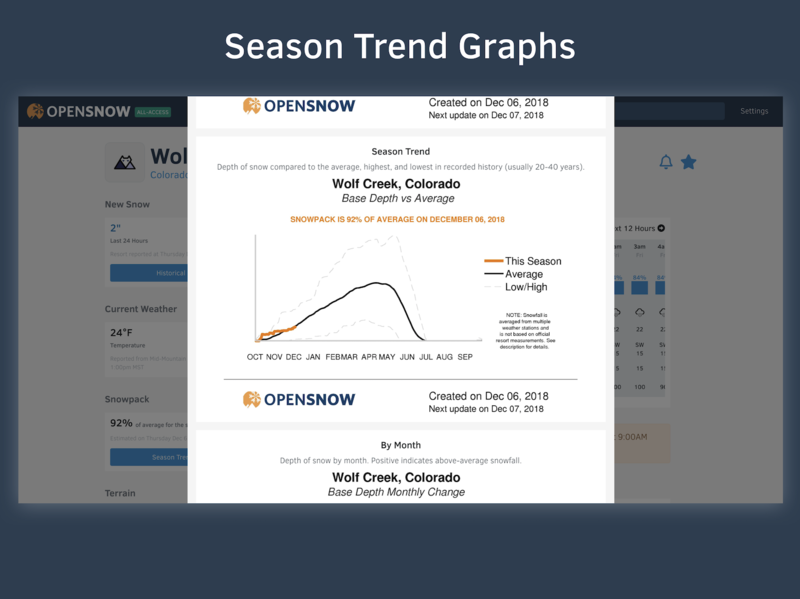 When you visit any individual mountain page, we provide the latest 24-hour report on the left sidebar, along with the total from last 5 days, Historical Snowfall, Current Weather (if available), Current Snowpack vs. Average, and a link to access our Season Trend Graphs. 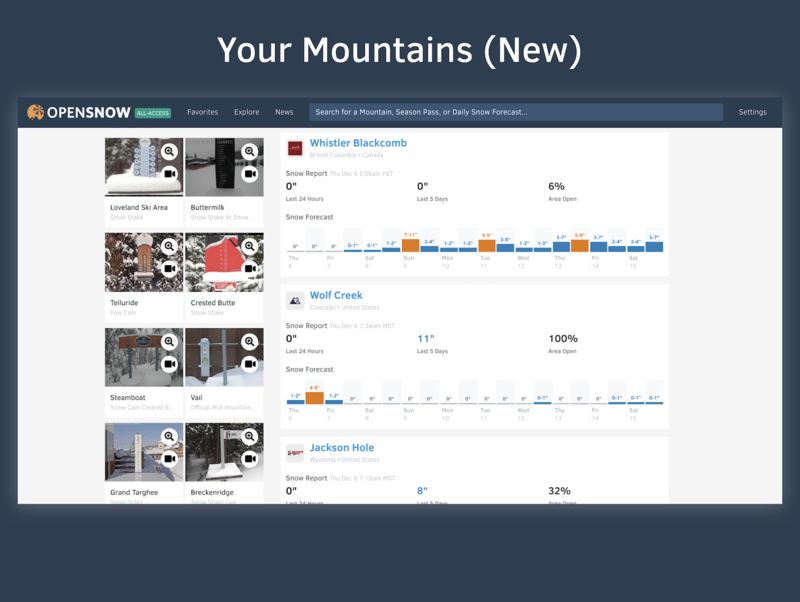 Further down the left sidebar, you will find Terrain updates (if available), Daily Snow Forecasts, a map of Nearby Mountains, and links to Mountain Information. Outside of the Conditions and Mountain Information, the first forecast dataset is the '3-Day Hourly Forecast'. Free users can see 6 hours of the hourly data, while All-Access subscribers can see all 3 days. 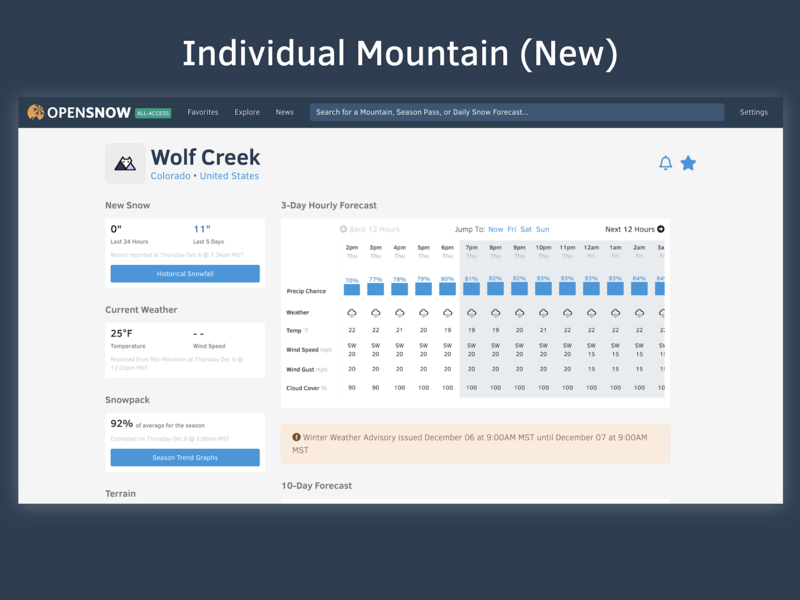 The hourly data is a new data set for OpenSnow and it is currently only available for mountains in the United States. The hourly data includes the chance of precipitation (including precip type), temperature, wind speed, wind gust, and cloud cover %. Use this data to time the next storm and dress appropriately for changing conditions on the mountain. Further down any individual mountain page, we vertically stacked the 1-10 Day Forecast. Free users can see days 1-5, while All-Access subscribers can see all 10 days. The daily forecast data includes the latest snow forecast for each day and night for the next 10 days, alerts (powder days, mixed precipitation, rain, high winds), temperature, the snowfall trend, the snow level, wind speed, wind gust, and cloud cover %. What about the Mountain Cams? These are located below the '10-Day Forecast'. 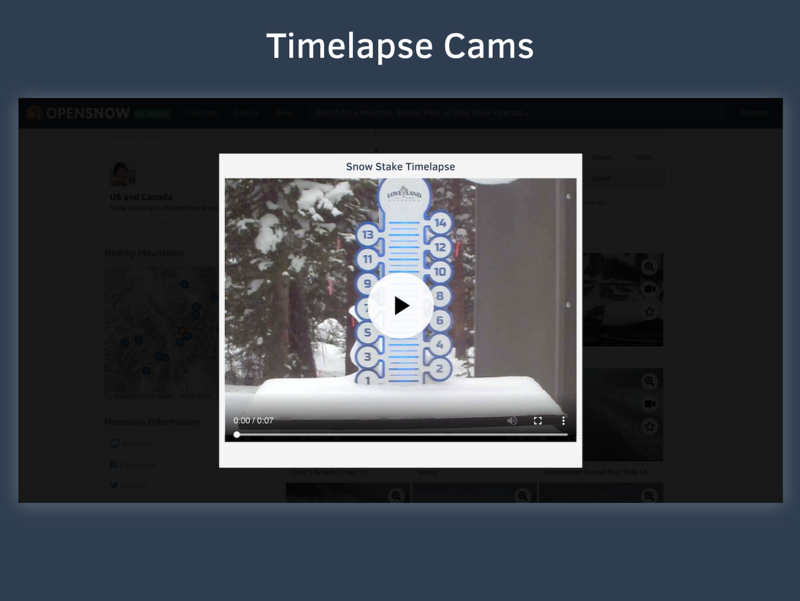 Click on any of the three overlays to enlarge the latest image, watch the 24-hour timelapse video, or save any cam to 'Your Favorites' (All-Access only). 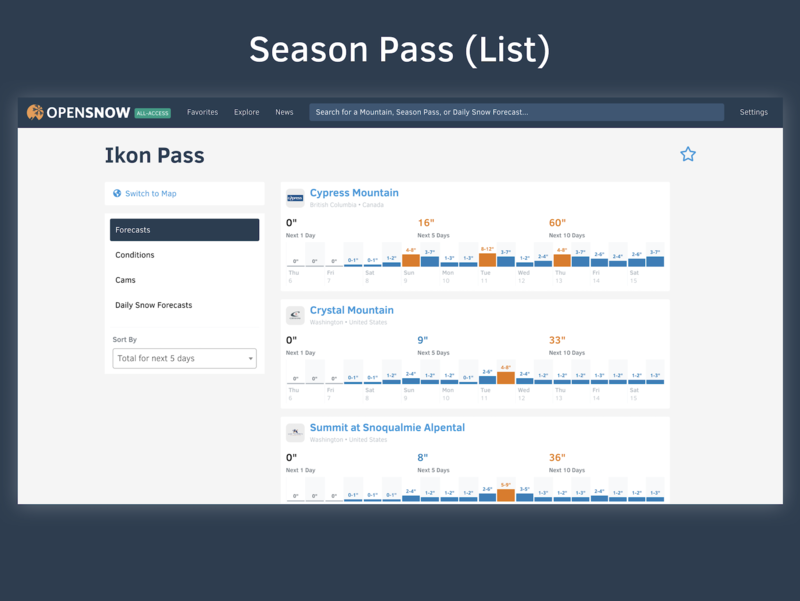 In the previous version, the 'Snow Forecasts' page consisted of a list of Regions, Passes, States, and Countries. 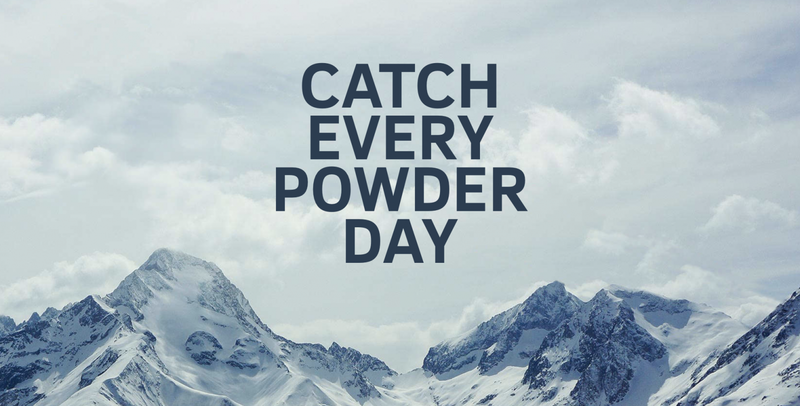 We also had a separate page for the 'Powder Finder' as the place to go for the Top Forecasts & Reports. 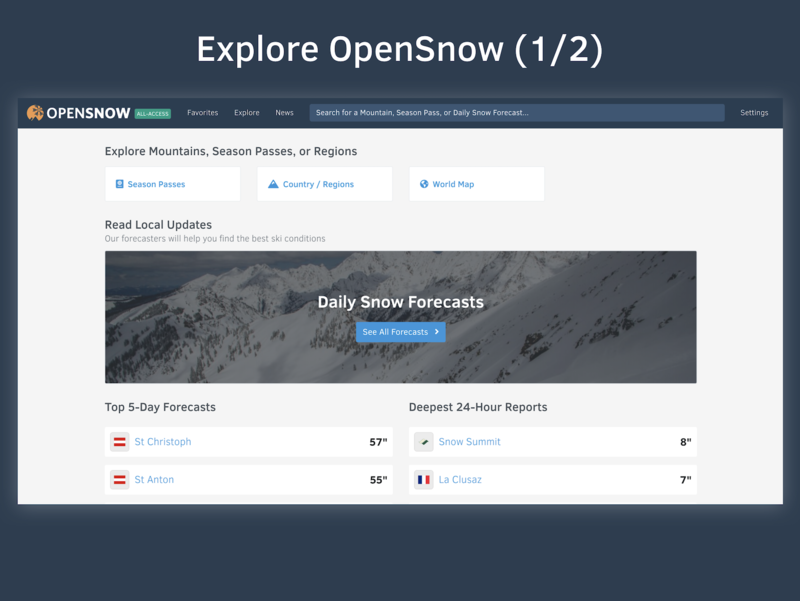 This has now been renamed to 'Explore' and we have combined the 'Snow Forecasts' list and 'Powder Finder' into an all-encompassing breakdown of every piece of information you need to find the deepest snow. Top Forecasts? Check. 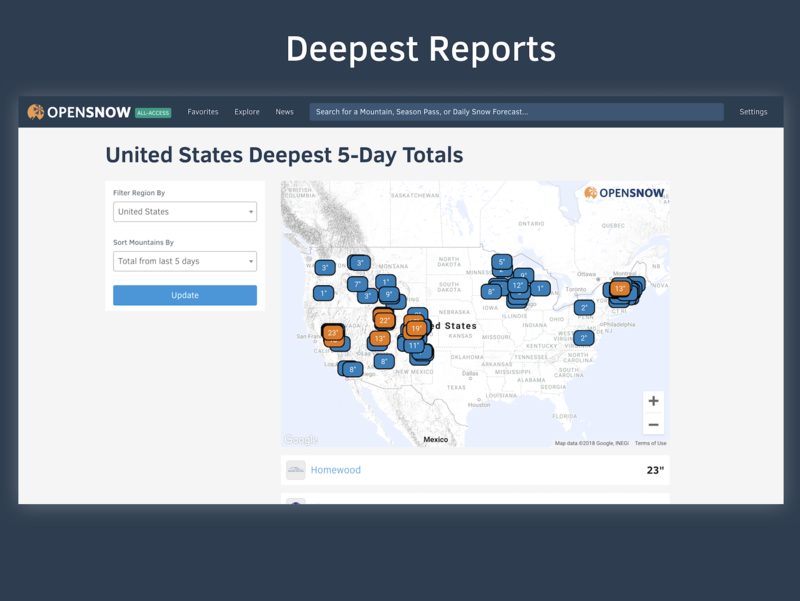 Deepest Reports? Check. Snow Stake Cams? Check. Season Passes? 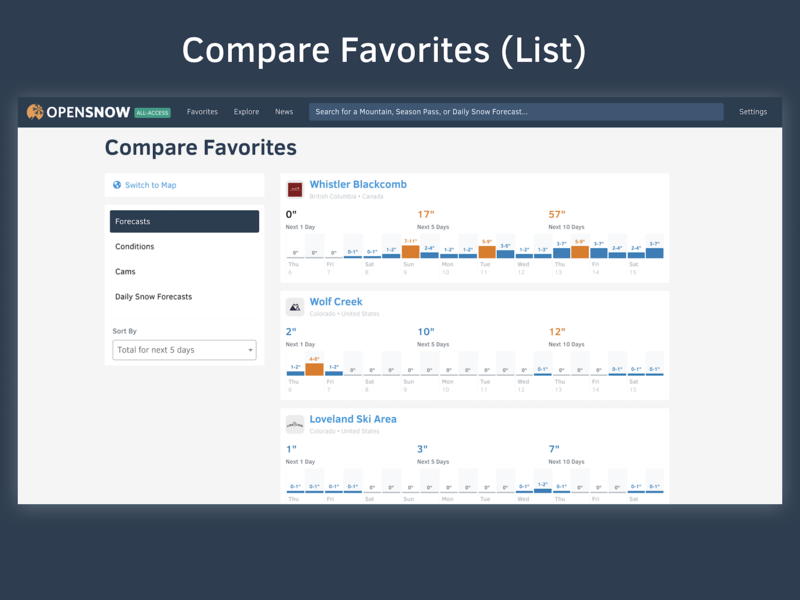 It's all there, with the ability to compare in a list and map view. 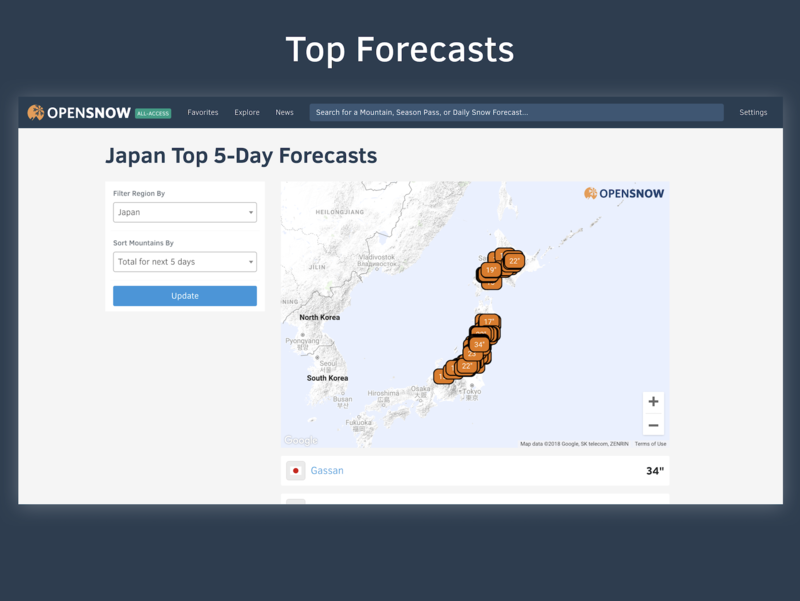 For the Top Forecasts and Deepest Reports, you can filter by region and sort mountains with the navigation in the left sidebar. 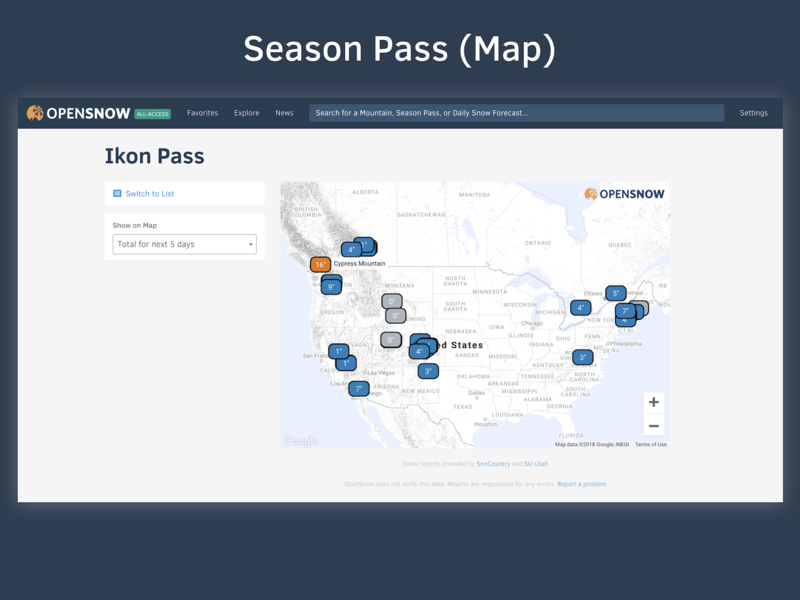 And just like 'Compare Your Mountains', we've provided the ability to compare any Season Pass / State in a list or map view. Due to privacy and technical challenges, we have removed the ability to log in with Facebook. 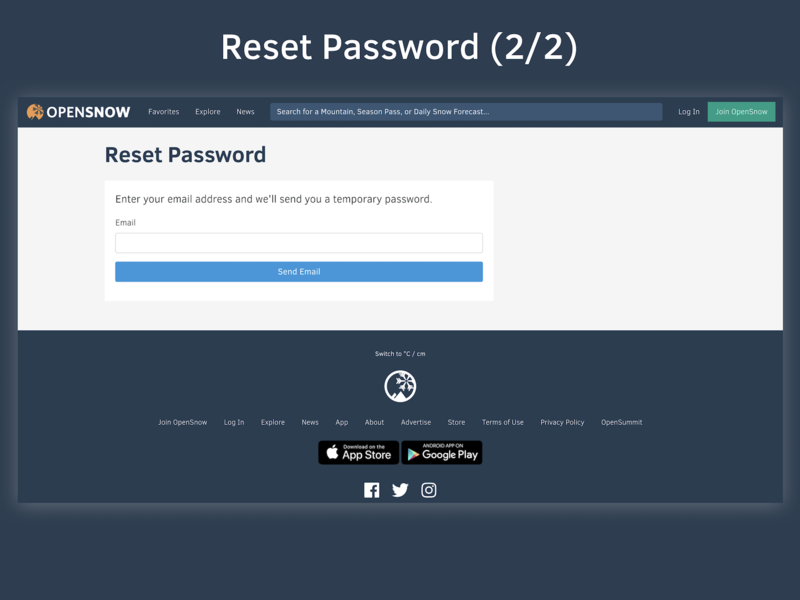 If you used Facebook to log in with the previous website, please reset your password and let us know if you encounter any issues.